Dandelions are great flowers to Draw. 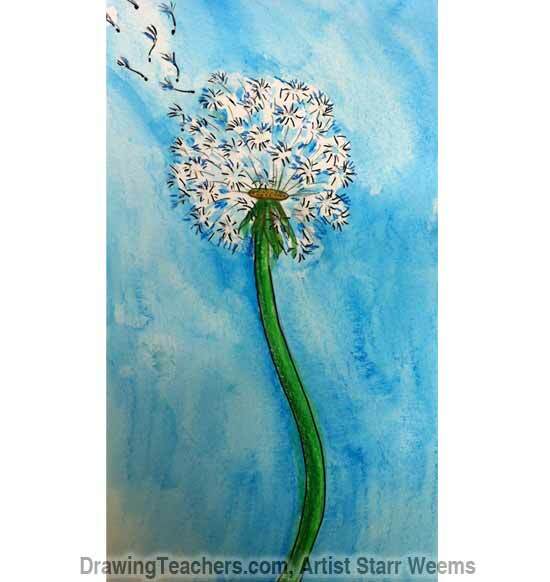 Learn how to paint a dandelion with watercolor pencils in this simple step by step lesson by Starr Weems. 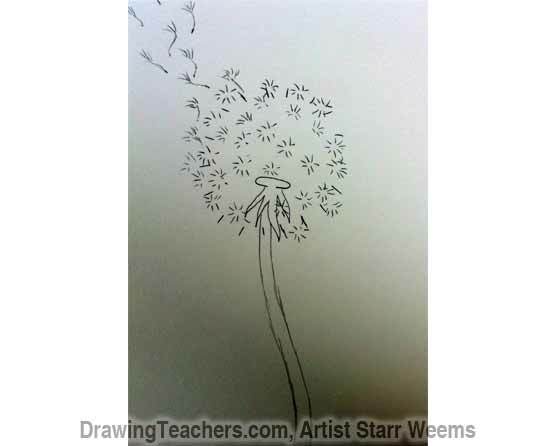 This dandelion drawing for kids or adults will be sure to make someone smile if you paint it and give it to them. When I blow on a dandelion and watch hundreds of fuzzy, white parachutes sail through the air, I always wonder where they will end up. How many miles do they travel before they settle into the soil and create another flower? 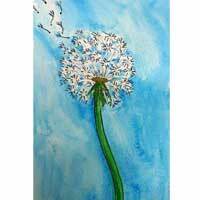 For this dandelion drawing, you will need a pencil, a permanent marker, watercolor pencils and a brush. step by step drawing tutorial. 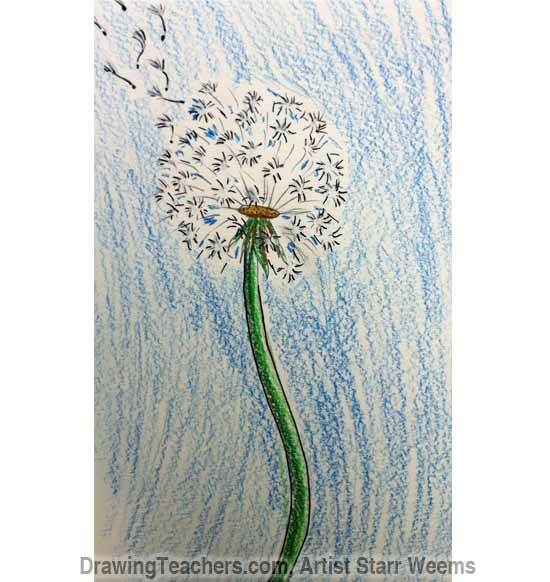 Scroll down to check out the complete lesson before you begin to be sure you leave enough room on your paper for the complete dandelion. 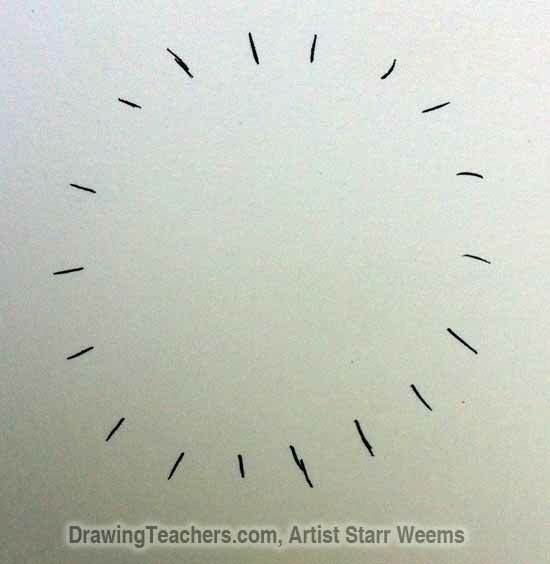 With your pencil, make a circle of short lines or dashes. Near the base of the circle, draw an oval with some pointy tentacles coming from the bottom of it. It should look a little like a jellyfish. 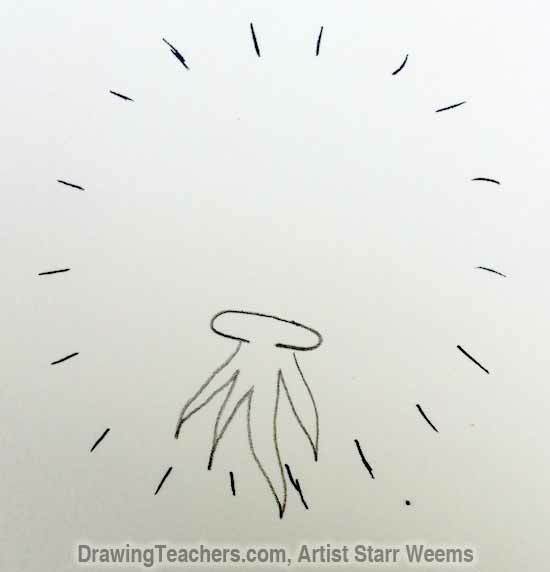 At the bottom of the jellyfish-like shape, add a stem. Fill in the circle with tiny clusters of lines that look like fireworks. Optionally, a few of the fireworks can be floating in the air outside of the main circle. Add a stem to those and maybe a tiny dot at the end of each stem. Add stem lines to the little fireworks shapes and add dots to the center wher th stems originate. With your watercolor pencils, color the oval at the top of the stem brown, the tentacles green and the main stem green. Color the background blue. Small areas inside of the dandelion bloom will also be colored in at random. 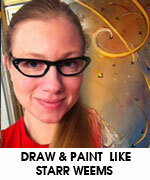 Blend the color with a brush and clear water. Don't totally color in the white area of the dandelion bloom. Just soften the blue spots with your brush. If desired, outline the dandelion with a permanent marker once it is dry. 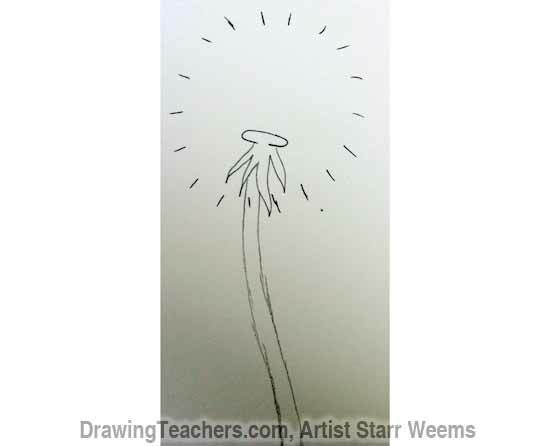 "How to draw a Dandelion!" 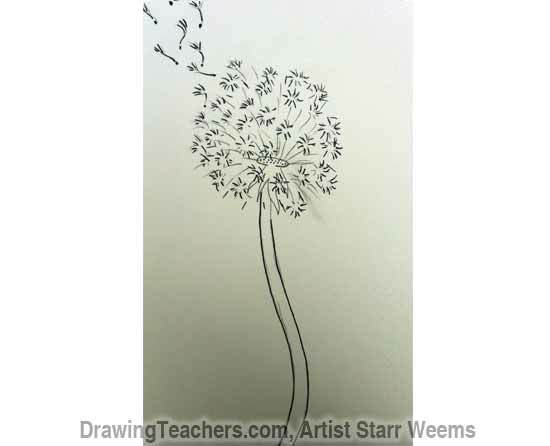 Please leave a comment below to let Starr Weems know how you liked her dandelion drawing lesson!